Updated: On 24th May 2013, US president confirmed Srinivasan as the first ever Indian to be the judge of the Supreme court of USA. +Barack Obama hails Srinivasan as a "trailblazer" and said "Sri is trailblazer who personifies the best of America. Now he will serve with distinction on the federal bench." Srikanth "Sri" Srinivasan 45 is on news for his nomination and Obama's support to serve on the United States Court of appeals for the district of Columbia Circuit. Srikanth's nomination is strong because of strong push from president +Barack Obama for his candidature. Srikanth Srinivasan currently is principal deputy solicitor general of the United States replacing +Neal Katyal (also an Indian origin) in August 2012. Srinivasan is said to be much qualified for the post and he has also argued 20 cases before the Supreme Court of US. Srinivasan was also a lecturer at Harvard Law School. Srinivasan got his name known because of his representation for former Enron executive Jeffrey Skilling in his appeal before the US Supreme Court Skilling vs United States. Srikanth Srinivasan born in Chandigarh India, but his family moved to Lawrence, Kansas, USA. His parents worked at +University of Kansas. Srinivasan studied at Lawrence School and graduated from Stanford University in 1989 and then he did J.D/M.B.A from Stanford law school and Stanford Graduate school of Business in the year 1995. If Srikanth Sri Srinivasan gets confirmed for the post he is nominated, it is assumed that he will be on the Supreme Court before the term of President +Barack Obama gets over. +Ami Bera the sole Indian-American member of the House of representatives also seems to be supporting Sinivasan's candidature, saying Srinivasan will be an outstanding court of appeals judge. 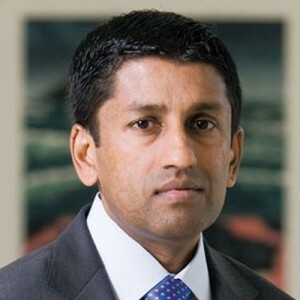 Srinivasan is regarded as one of the best legal minds in US and hopefully he will be chosen for the post as expected by many Indian-American people.